Mike McKenna 6:26, Rob Orlando 7:22. Post time to comments. 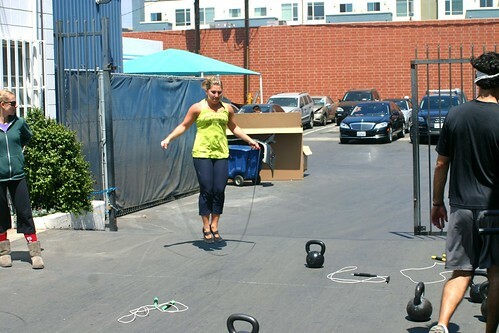 This WOD, assuming your cardio-respiratory endurance and stamina are solid, is very skill dependent. Both movements are technically challenging, and it may become easy to lose count at any point. Keep your wits about you, stay mentally relaxed, and show off your skillz! The “Wall-Ball 2-fer-1” is a regular wall ball shot but you perform another air squat while the ball is in mid-air. Starting today, August 2nd, there will be NO MORE 8 am REGULAR CLASSES and NO MORE 7 am ON-RAMP CLASSES. Instead we will have 7 am REGULAR CLASSES Monday through Friday, and 7:30 On-Ramp classes for Monday, Tuesday, and Friday. All other classes will remain the same. Saturday, August 14th is CrossFit Ventura’s Individual Competition ‘Central Coast Clash.‘ Starts at 9 am and will feature 2 WODs. We applaud the members who have already registered. Partaking in a multi-affiliate CrossFit competition is an unforgettable experience. Only 72 athletes are allowed to compete and registration closes August 8. Find out more here. This Saturday, August 7th, will be another Team WOD. Details to follow. “What I Know Now: Nibbled to Death” by George McGovern, Inc.
“9 Things I Learned in 9 Years as a CEO — Part I” from Inc.